Many women still persist in their quest for a tight torso and slim hips bound by the myth of "targeted fat loss"...meaning they think they can eliminate fat in a specific area by concentrating exercise to that one region of their body. This is seen most prevalently when losing belly fat is at issue and women think increasing the volume of sit-ups, crunches, and twisting exercises will burn it exclusively and quickly. That's not how it works. The reason is, that there is no such thing as "area ownership" of fat. Although focused exercises will strengthen the abdominal area tremendously, the only way to eliminate belly fat is through a combination of calorie reduction by good nutrition, gaining lean muscle through weight training, and intelligent cardio with interval training. Although extremely well-defined abs on women are many times the product of outstanding genetics...or sadly, pharmacological (steroid) intervention for professional bodybuilders...normal women can reduce the layer of fat covering their abdominal muscles with a proven program. The very best one we have found is Flavia Del Monte's Full-Body-Licious program. It is a comprehensive course of commitment to nutritional awareness, focused weight training, and far-sighted cardio. The best abs workouts are those that are integrated into strength training, and include the whole body. Flavia's programs shows you the secrets fitness models use to reduce their overall body fat down to the levels where muscle definition is readily seen. The best thing is, though, that she helps you get to your goals without harmful starvation diets that foul up your metabolism, without idiotically intense workouts that rob you of energy and vitality, without mindless hours on cardio machines or running 10 miles before sunrise, and without the use of dangerous drugs. Flavia's program is straight forward in its presentation of an integrated program of nutrition, building lean muscle, and utilizing interval training to lose belly fat. A Registered Nurse, and certified fitness professional herself, Flavia practices what she preaches. * You will learn the best foods you should ALWAYS eat, and the worst foods you should almost NEVER eat for your best abs diet. 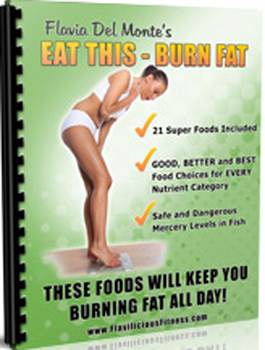 * You will learn how to break through any fat loss plateau. * You will learn the psychology of permanent fat loss and the goal-setting methods used by Olympic athletes. * You will learn that you can achieve your fat loss goals without spending $$$ on supplements, and how you are ripped off by these companies and health food stores. * You will learn how to control your carb intake and keep building lean muscle without damaging your metabolism. 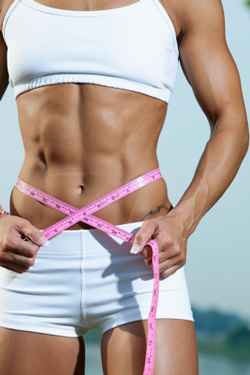 There is a sensible way to getting cut female abs. * Best of all, you will learn that you can rely on yourself to make excellent food choices, modify your weight training program, and adapt your cardio to reach your goal of female six pack abs. Full-Body-Licious is about becoming far more aware of how your body functions and what is needs to maintain permanent fat loss.